This is beautiful and intriguing.. This honestly just looks like you've rewritten some of the UI, changed the textures, slapped some shaders on and called it a mod. Pipeline? You really cannot just claim that you've improved how the instructions are relayed to the processor, especially considering the JVM handles all of that for you. There's already a coordinated set of instructions relayed to the processor by the JVM, and the JVM does some optimisation of the code (as much as a computer can do, at least) itself during compilation, so I don't believe you when you say that you somehow improved the game by introducing a new "pipeline". Memory cache? Again, I call fake. The JVM handles all the memory itself, and there's no such thing as a "cache" that allows you to store memory and access it faster. This is what RAM is, RAM (DRAM really) is designed to be quick-access temporary memory for frequently used data, and the only faster type of memory is the CPU cache which is only used as a buffer so the CPU doesn't have to constantly refer back to the RAM (which would act as a bottleneck). And you cannot tell the game to "use the cache" as it already does when the CPU needs to access data. So, again, I don't believe you. I'll give you that for the rendering system, but honestly I don't see many improvements if you're on a GTX 650, on what I assume are default settings cranked up (render distance normal, but cranked up settings), and are getting 157 FPS. That's average for a decent video card. 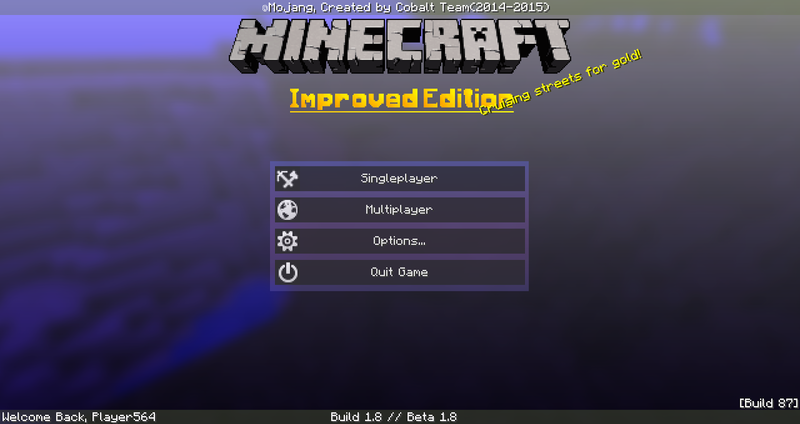 So I don't believe you improved it as much as you claim, but it's still possible you have (Mojang's is honestly bad, but getting MUCH better). I honestly don't see a big improvement to graphics. All I see are some custom shaders which over-saturate the game and make lighting warmer (I am a fan of the warmer lighting, kudos on that part). For "stunning graphics" they honestly do not look that good. And if you did rewrite the game's internals, you'd have enough control to do some pretty impressive visual changes, but you haven't, so I'm saying they're not impressive graphics. What I see is what I'd refer to as a "personalised client", you grabbed the source code and changed the code around to make it look the way YOU want it to look. I personally think the main menu looks bad, my opinion. If this is such a "optimised" and "enhanced" version of the game, why not show comparisons between vanilla and IE. Have the exact same settings, exact same world, exact same location, and provide comparisons between how the game runs. For now, I do say this is misleading. I don't believe this is an enhanced version of the game, and I'd personally be hesitant to download and run it. My opinion, but I want to raise the question. If this is an enhanced version, why do you make claims that are wrong? As I pointed out, "memory cache" is a made-up term used to influence the non-tech-savvy to thinking this is legit (my opinion, but it's still a made-up term because there isn't a "memory cache technology" the game can use, it's already having it's memory managed by the JVM), and the "pipeline" is blatantly incorrect because you wouldn't be able to do what the OP claims without using an entirely different language, and this is in Java as if it wasn't, it couldn't be loaded or even detected by the launcher. So, I call misleading and fraudulent. To the OP, I hope you follow through and post comparisons. Thank! Have fun with Minecraft IE! Sorry, I perhaps misspoke but when I mean a pipeline I want to talk about the main loop. So, I mean by memory caching is that minecraft saves RAM with the new main loop. I honestly don't see a big improvement to graphics. All I see are some custom shaders which over-saturate the game and make lighting warmer (I am a fan of the warmer lighting, kudos on that part). For "stunning graphics" they honestly do not look that good. And if you did rewrite the game's internals, you'd have enough control to do some pretty impressive visual changes, but you haven't, so I'm saying they're not impressive graphics. Yes, i know, i will probably improve it a little more this summer because now i don't have the time. What I see is what I'd refer to as a "personalised client", you grabbed the source code and changed the code around to make it look the way YOU want it to look. I personally think the main menu looks bad, my opinion. You're not the only one to say that to me but i already improve it the last 2 weeks. Also, if you don't like it , propose ideas to improve it. If this is such a "optimised" and "enhanced" version of the game, why not show comparisons between vanilla and IE. Have the exact same settings, exact same world, exact same location, and provide comparisons between how the game runs. To start off on a nicer note, that UI looks much better now. Kudos to you, nice work. Okay, so what sort of things have you done / are planning to do to increase performance and save on memory usage? You have to remember, not everyone here is non-tech-savvy, people like me and other programmers do know stuff about computers and can understand things, so you should edit your main post to maybe elaborate on how exactly you will improve performance. Are you planning on optimising code? Cleaning out junk code? Rewriting the renderer? Elaborate on these, and more tech-savvy people will find this truthful. No offence, but in the opinions of me and a couple friends, with vague explanations like improving the "pipeline" (perhaps you should replace "pipeline" with "thread", or "main loop", pipeline and loop are completely different things and there is no pipeline in the game except for rendering, which is not what you were talking about), adding memory "caching" (again, should rephrase this, when you said improve RAM usage I assume you meant optimise and clean out code to make it less of a memory hog(? correct me if I'm wrong), which is completely different to caching. Caching is a process of adding a buffer to the CPU die to allow the CPU to be fed data constantly without looking back to the system RAM, the underlying hardware fills the cache with data from RAM (instructions and arguments mostly) and the CPU just looks at the "front" of the cache for data to use / execute) makes this seem really tacky, fake, and honestly a scam. Just some food for thought. If this does what you advertise, I applaud you. As I suggested previously, perhaps include some comparison screenshots and videos to show how much of a difference this makes. And if you haven't started work on this, maybe reword things, because the way it's worded implies that the mod will definitely improve performance, and if you only have ideas and concepts, you have no idea what the outcome may be. Some optimisations you do to the code that you think will improve performance may in fact hinder it and make it worse. Perhaps reword the post to make it sound like this is what your goal is, rather than this is the definite outcome of it. You do not want to misinform people, people who have downloaded this expecting performance improvements but have gotten impacts to performance is much worse than dropping the mod because of some reason. At least with the latter, you have the ability to pick it back up once you've recollected your thoughts and ideas. Hi everyone, Cobalt Team is back on this forum! We change the team who manage this account! now, this team are more professional and they can "really" answer your question! We fixed a ton of bugs in this version ! Also, we have made ​​changes in design! Enjoy! Kudos awarded here...Java coder, also forgot to mention fraud. Read this comment and this one. Sorry about that! Now, The peoples who handles this account are tech-savvy Also with Minecraft IE, we remove the limit for FPS(I think before its 30 FPS minimum, and now its 60 FPS!) Also, We remove the big lag spike from 1.8 saving system! Limit for FPS? Could you elaborate on that? Because I know of no limit on FPS. 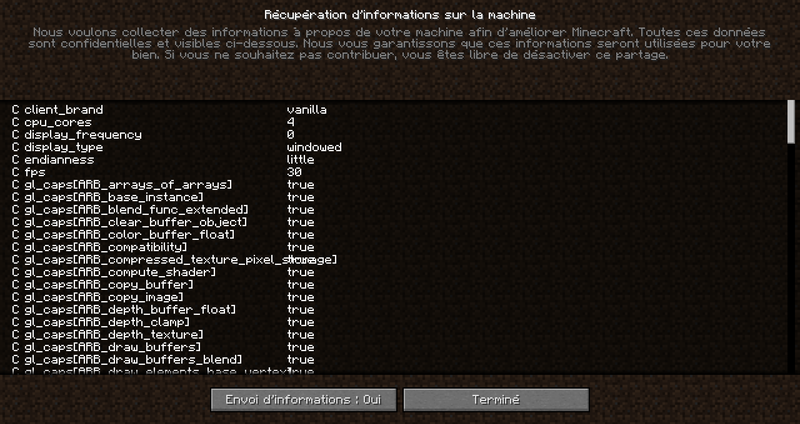 Minecraft imposes ridiculous limits for FPS. The problem is that this number changes dramatically, it causes lags! We fixed the problem by changing the FPS limit number to 60 FPS, which is pretty smooth. So that the game really is more smooth on the interfaces! Are you talking about the FPS limit in video settings? Again, I know of no FPS limit imposed apart from that one, which is configurable by the user. Minecraft's VSync is rather dodgy. Works apparently by setting the FPS limit to the monitor's refresh, which is usually 60 FPS. Though I hear it sets it to 30 if "real" FPS drops below 60. Which can cause weird lag if "real" FPS oscilates aroud 60FPS causing Vsync to constantly switch between 30 and 60 FPS limit. Ah, interesting. Did not know that. We fixed a ton of bugs in this version ! Also, we have made ​​changes in design & UI tweak! Enjoy! 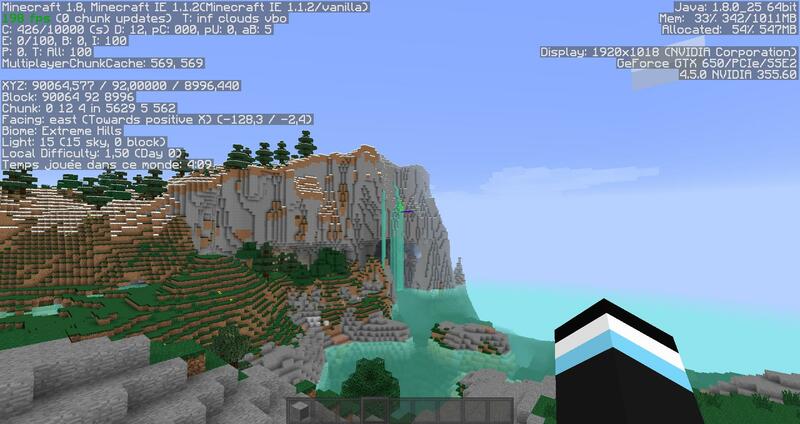 and it added even more fps to my minecraft!